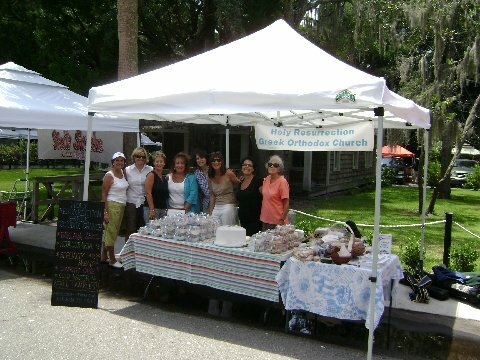 We all had a wonderful time at the Farmer’s Market and were able to raise about $300 for the church! Because of the weather being so warm, the traffic wasn’t as great as we were hoping, but I’m sure that as we move into August and September we’ll see more traffic and we’ll be able to sell even more of our wonderful goodies! Please take a look at the attached pictures that we took throughout the afternoon! So many people helped out and I hope that I don’t leave anyone out as I say “THANKS”! We had quite a few people making the baklava – thanks so much to Frank and Karen, Bernice and Jack, Anna Wisner, Allison Macropolis, Litsa Goulis, and Jeanne Haight. It all looked beautiful and was so good (of course it was all taste tested!!). Allison, Jeanne, and I packaged the baklava and got it all ready to go – thanks for that help! We ended up with about 114 containers of baklava. Thanks to Venus for making some wonderful finikia for us – people were buying that up as well! Jovanka Giric made some fantastic cheese bread, whole wheat bread, and whole wheat rosemary bread. Once everyone had a sample they wanted to buy some! I made some Koulourakia and it sold as well. One of the most wonderful things about the Farmer’s Market Thursday was the amount of people that came to support us and those who stayed and volunteered! We had a great time and were really able to get to know each other better, which was great! Thank you SO much to Bernice, Allison, Litsa, Jeanne, Jovanka, Jinny, Carol, Venus, Christina, and Anna (and her son Georgie!) for coming by and for helping out! A special thanks to Sperry and my husband Larry for coming to help us set up before it started and for coming at the end of the day to help us clean everything up! It was such a big help because we were tired by the time 6:00 rolled around! I have to thank Jeanne, Allison, and Jovanka because they were there with me ALL afternoon working! Thanks to Carol and Jinny for “taking to the street” with containers of baklava and koulourakia trying to drum up business! We’ll need you next month! Jinny and Carol were with us most of the afternoon and I so appreciate the help! Bernice also brought cookbooks and information about the church and we actually had someone sign up to receive more information about our church community! The Farmer’s Market is certainly not something that one person can take on by themselves – you need great people to work with. Everyone pitched in and helped, from donating coolers, bringing tables, tablecloths, food, and most importantly, giving their time to come together to make this so successful. I look forward to next month and being able to work with everyone again! If you were not able to come by this past month, we will be at the Farmer’s Market again the end of August and the end of September. Please come join us – we really had a great time!! If you are interested in baking or helping out, please call me: (h): 342-3742 or (w): 342-4210 or email me at: bourniasb@yahoo.com.